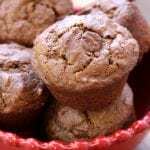 A fluffy, nutritious chocolatey muffin with hints of almond butter and creamy chocolate chips. Combine all dry ingredients (except sugar) and set aside. In a separate bowl mix oil, sugar, almond butter until well combined. Add milk and eggs and stir until combined. Gradually add dry ingredients into wet, mixing until just combined, scraping down sides occasionally. Stir in chocolate chips. Pour batter into prepared muffin tins. Batter will come almost to the top. Bake at 375℉ for 10 minutes and then lower the temperature to 350℉ and bake for another 10-15 minutes. Check doneness with toothpick inserted into center of muffin. Let cool in pan for 10 minutes. Remove and finishing cooling on cooling rack. Using two different temperatures for baking aids in the rising of the muffin. The amount of baking powder helps in creating beautifully fluffy muffins.